Enjoy your breakfast in our bright, south-facing dining room. At Knabbs Ash, your breakfast is really important to us! 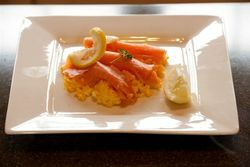 Why not try smoked salmon & scrambled eggs for a change? 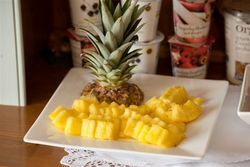 After a good night's sleep, we welcome you downstairs in our homely dining room where we serve breakfast. We also have a separate sitting room with a large flatscreen television and a fire for cold days and evenings when extra heating is appreciated. The sitting room leads out through patio doors onto the patio area where guests can sit out on warm summer evenings to enjoy the evening sun, looking out onto the Yorkshire Dales. The dining room has separate tables for each group of guests. 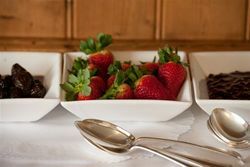 Help yourself to a selection of starters while your cooked breakfast is prepared to your wishes. Wherever possible, our food is supplied by local trades using local produce from in and around Harrogate. We collect eggs daily from own flock of hens which roam freely during day time over our fields and garden! 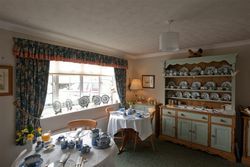 At breakfast time, the dining room frequently benefits from the invigorating effect of the morning sun shining through the south facing window - just right to start the day. Taylors of Harrogate tea or coffee. Based in Harrogate, North Yorkshire. 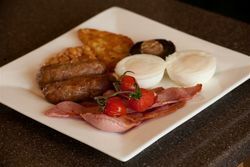 At Knabbs Ash we take pride in our breakfasts at our Bed and Breakfast Accommodation.